The first inductee for 2011 was Vince Coleman. Today, we welcome Cookie Rojas. There might not be a better example of how the game of baseball has changed in the last half century than Octavio Victor “Cuqui” Rojas. Born in Havana, Cuba on March 6, 1939, Rojas was an acrobatic middle infielder that played in the major leagues for 16 season, even though he was a career .263 hitter with an on-base percentage barely over .300. In the game today, every player is expected to contribute offensively and Rojas probably doesn’t make it out of the minor leagues. That would be such a loss for baseball because fans would be deprived of one of the best loved and perhaps smartest players to play the game. There might not be a more easily recognized player either. If you somehow missed the translucent plastic frames holding those giant lenses, or the effervescent smile that can only come from somebody that loves what they are doing, just wait a few moments. Rojas will be the one diving for a ground ball or leaping high in the air to avoid a base runner while tuning a double play. In the end, he will leave you with a similar smile because you have just become another in a long line of Cookie Rojas fans. 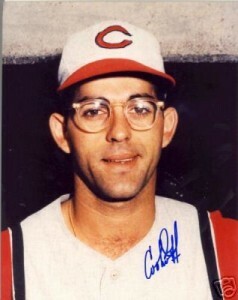 Rojas was drafted by the Cincinnati Reds in 1956, at the age of just 17. His dad had wanted him to be a doctor, but the young infielder had different ideas. He progressed through the Reds minor league system, playing for West Palm Beach (D) in 1956, Wassau (C) in 1957 and Savanah (A) in 1958. Although his power numbers improved and his glove was always solid, his overall batting average dropped at each level. In 1959, he returned to his home town of Havana, which happened to be the Reds AAA affiliate. His batting average continued to fall, reaching a new low point of .233. With Leo Cardenas and Elio Chacon both hitting better than Rojas, Cookie would return to Havana for the 1960 season, a most unusual one for the franchise. When Fidel Castro nationalized all US-owned businesses in Cuba, the Reds moved the Sugar Kings to Jersey City for the remainder of the season. Rojas continued to struggle at the plate. With Chacon and Cardenas with the big club, Rojas got more playing time with the Jersey City Jerseys (AAA) in 1961, and he made the best of it. His offensive numbers improved significantly, his batting average jumping to .265. He would also drive in 44 runs. This would turn out to be the story of Rojas career – the more playing time he got, the better his production at the plate. Rojas make the Reds out of spring training to start the 1962 season, and made his major league debut against the Los Angeles Dodgers on April 10. In his first major league at-bat, he would lay down a sacrifice bunt, moving Eddie Kasko over to third base ahead of Vada Pinson and Frank Robinson. That would be another trademark of Rojas career – although he didn’t hit with power or any great regularity, he could handle the bat in sacrifice situations. After two months of struggling at the plate, Rojas would finish the season with the Reds new AAA Affiliate, the Dallas-Ft. Worth Rangers, but he would be back soon, as a September callup. With the Reds infield looking set for the foreseeable future, they traded Rojas to the Philadelphia Phillies after the 1962 . In return, the Reds got a right handed pitcher named Jim “Bear” Owens. Owens would not last long in Cincinnati. He would be sent down to the minors and Houston would claim him in the Rule 5 draft. Philadelphia had two very good middle infielders, Bobby Wine and Tony Taylor, but Rojas found a way to get into games, first backing up Taylor at second base and then occasionally in the outfield. As his hitting improved in 1963, the Phillies found any way they could to get Rojas into games. He would play all eight defensive positions in 1964, and again in 1965. With a batting average finally over .300, Rojas would get an invitation to play in the 1965 All Star Game, as a second baseman. He would also receive some MVP votes, recognition for his improvement and ability to play anywhere he was needed. What was originally a stunt to keep him in the lineup had become yet another trademark of his major league career – the ultimate utility player. But even that would eventually come to an end as Rojas became the every day second baseman, taking over those duties from Tony Taylor in 1966. He and Bobby Wine would turn into one of the best double play combinations in baseball. Fans would start calling duo the plays of “Wine and Rojas”, referring to the popular song, “The Days of Wine and Roses”. The one position Rojas had yet to play was pitcher, and that changed in a blowout against the Giants on June 30, 1967. Trailing 12-3, Rojas came into the game in the ninth inning. He gave up a single to Tom Haller. Hal Lanier reached base on an error. Rojas then retired Tito Fuentes, Juan Marichal and Willie Mays to end the inning, stranding both base runners. That would be his only relief appearance, so his career ERA stands at 0.00 and his WHIP is just 1.000. With a young infield prospect named Denny Doyle turning heads in the Phillies farm system, Rojas would be traded away to make room at the end of the 1969 season. The Cardinals were also ready to shake up their roster, and the two teams agreed on a multi-player deal that would alter baseball history. St. Louis would send Tim McCarver, Byron Browne, Joe Hoerner and Curt Flood to Philadelphia for Rojas, Richie Allen and Jerry Johnson. Curt Flood would refuse to report to the Phillies and the Cardinals were forced to send prospects Willie Montanez and Jim Browning to complete the deal. Flood would challenge the reserve clause in 1970, eventually losing, but that would make way for a successful challenge four years later. Cardinals fans were excited to see Rojas in a Cardinals uniform after all the years of watching him as a member of the Phillies. With injuries and age starting to catch up to Julian Javier, the happiness over Rojas was tempered by sadness in the realization that Javier’s Cardinals days were coming to an end. Surprisingly, it was Rojas that left first, not Javier. 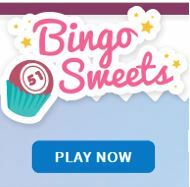 But not before one exciting play. The date was April 14 and the Montreal Expos were in St. Louis. In a rare rough outing from Bob Gibson, an early 3-0 Cardinals lead had turned into a 4-3 deficit in the top of the seventh inning. Thanks to some outstanding relief pitching and a Jose Cardenal home run in the bottom of the inning, the Cardinals tied the game, and it went into extra innings. In the top of the tenth inning, Sal Campisi gives up a 2 out walk to Mack Jones. Marv Staehle triples Jones home to give Montreal a 5-4 lead. Howie Reed tries to close out the game for the Expos, but the Cardinals had a much different plan. Leron Lee leads off the bottom of the tenth with a single. Joe Hague reaches base when Bob Bailey boots a ground ball. Julian Javier fails to advance the runners, forcing Lee at third base on a fielders choice. Pinch hitter, Jim Campbell singles home Hague to tie the game. Vic Davalillo is intentionally walked to load the bases, setting up the double play at just about any base. Cookie Rojas comes off the bench to pinch hit for Sal Campisi and hits a slow roller to third base. It is too slow to turn a double play and Javier scores easily with the winning run. Leave it to Rojas to deliver a walk off single and the ball never leaves the infield. That would be the lone highlight of Rojas Cardinals career as he would be traded to Kansas City in early June. Even though he failed to find a home in St. Louis, Cookie couldn’t have found a better place to launch his second career than with the expansion Kansas City Royals. 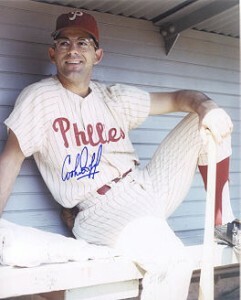 He immediately took over second base duties, and just as he had done in Philadelphia, raised his batting average back to a respectable level. 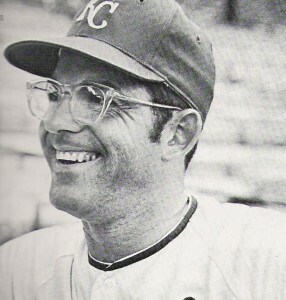 He would hit .260 for the rest of the 1970 season and .268 for his entire time with the Royals. Fans immediately fell in love with Rojas and his acrobatic plays at second base. One of them was captured by the Topps baseball card photographer and his 1971 card remains one of my all time favorites. That image says everything you need to know about Cookie Rojas. 1971 would be a very good year for Rojas, hitting .300 for the second time in his career. He would also set a new career high for on-base percentage (.357) and slugging (.406). He would also be rewarded with his second All Star Game invitation, the first of four consecutive in which he would represent the Royals. He also received more than a token nod in the MVP ballots. Perhaps his greatest moment as a member of the Royals came in the 1972 All Star Game. With the American League trailing 2-1 in the eighth inning, Rojas steps up to the plate with Carlton Fisk on first base and two outs. Rojas pulls a Bill Stoneman pitch deep into the Atlanta left field seats for a 2 run homer, giving the American League a 3-2 lead. That home run was also historic in that it was the first AL homer to be hit by a non-American born player. Unfortunately for Rojas, Wilbur Wood could not make the one run lead hold up and the National League would win 5-4 in 10 innings. Rojas continued to play well for the Royals, but as in Philadelphia, he was about to lose his job to a younger and more talented prospect. This time it would be Frank White, but instead of being traded away, Kansas City was smart and kept Rojas around for the rest of his career, which ended in 1977. That also helped the fans who were slow to embrace White, preferring to see their favorite, Rojas, playing every day. Once again, Rojas versatility came into play, backing up White at second base, occasionally playing third and even, ironically, as a designated hitter. Rojas playing career ended in 1977, but that was not the end of his baseball career. For his long and productive major league career, Cookie Rojas has been honored as a member of both the Philadelphia Phillies and Kansas City Royals Baseball Hall of Fame, as well as in his homeland of Cuba. Rojas stayed involved with baseball, first as a scout and then as a coach. In 1988, he managed the California Angels, but after failing to reach .500, was replaced with 8 games remaining in the season. Rojas returned to coaching with the Florida Marlins, New York Mets and Toronto Blue Jays. You can find Cookie Rojas today as the Spanish language broadcaster with Fox Sports Florida, providing color commentary on all Marlins home games. His son, Victor, is also also a broadcaster, first with the Texas Rangers and now with the California Angels. 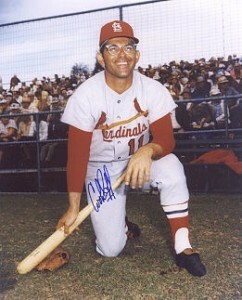 Bob Netherton covers Cardinals history for i70baseball.com and writes at On the Outside Corner. You may follow Bob on Twitter here or on Facebook here.